Stands Unique are proud to introduce the no-compromise Claritas digital media server enclosures manufactured exclusively in the UK employing a build quality equal to and exceeding the highest audio Hi-Fi equipment available. The range has been developed over the past four years working closely with Intel GB to develop a superior enclosure for the next generation of media servers. Media PC builders have won great acclaim with the use of the Claritas enclosure - What Hi-Fi Sound & Vision gave the Uvem 200/10000 RA Classic 'Best Serious Home Cinema PC' Award for 2005. It is used in their Reference system. "The humble home computer is hardly new, but one that looks this domestically acceptable - and more importantly, performs to such a high standard - is certainly special. We like the Uvem so much we use it in our reference system. That'll be good, then." If you are serious about getting the ultimate from the source material and display then check out the Uvem products - they are, quite simply, remarkable and used as a Reference digital source for driving the best displays and projectors made today. Many well know manufacturers at events and exhibitions use one to get the very best out of their digital display. 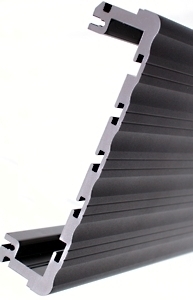 Quality - All aluminium construction comprising 7mm thick sides, 3mm top and base with a 10mm solid aluminium facia panel hand finished and bright anodised to give a superior finish. 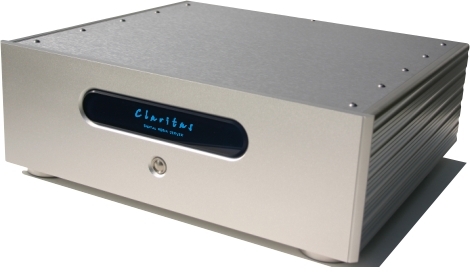 Compatibility - The Claritas is the standard width of Hi-Fi /AV equipment at 440mm. The Claritas 260 Series is shallower than any conventional computer at only 260mm deep. Designed to fit into any standard hi-fi cabinet or stand, the deeper Claritas 390 series is designed for maximum capacity and offers more choice of internal components. The attractive 6mm thick acrylic graphic panel to the front is edge-lit using a blue led light for subtle effect and neatly doubles as a discrete DVD / Blu-Ray / CD drawer cover. Simply press the panel to eject the drawer. Customised graphics are offered, the standard graphic reads Claritas with the words DIGITAL MEDIA SERVER underneath as shown in the pictures.. Flexibility - "The PC in your living room concept" allows the computer to be upgraded by simply replacing any outdated components as and when necessary, whilst retaining the high quality enclosure - giving extra functionality with no fuss. Each of the ranges offers something slightly different based around inexpensive industry standard components. Infra-red control is also catered for via the discrete dark blue front optical drive cover which is specially coated on the rear with an infra-red transparent coating. Such is the lasting build quality and flexibility of the enclosure, it can be used to house a number of different applications including multi channel AV power amplifiers. PC for the office or home where appearance and low noise are important. Personal Video Recorder - record any video source onto hard disc for playback anytime. Edit video and burn to DVD, Blu-Ray or CD for archiving. Video Processor- scale and process superior quality DVD video and High Definition Blu-Ray for progressive scan HD devices. Audio amplifier enclosure - an impressive highly practical presentation for a home built project. Mounting slots for power boards are already built into the side extrusions which act as efficient heatsinks. Sound server enclosure for multi-room applications.